Wait. It's not what you think. Yes, it's homemade jam. But, no. It's not the all-day, elaborate canning equipment kind of jam. It's skillet jam. Which means you are going to go from fresh fruit to finished product (including washing the dishes!) 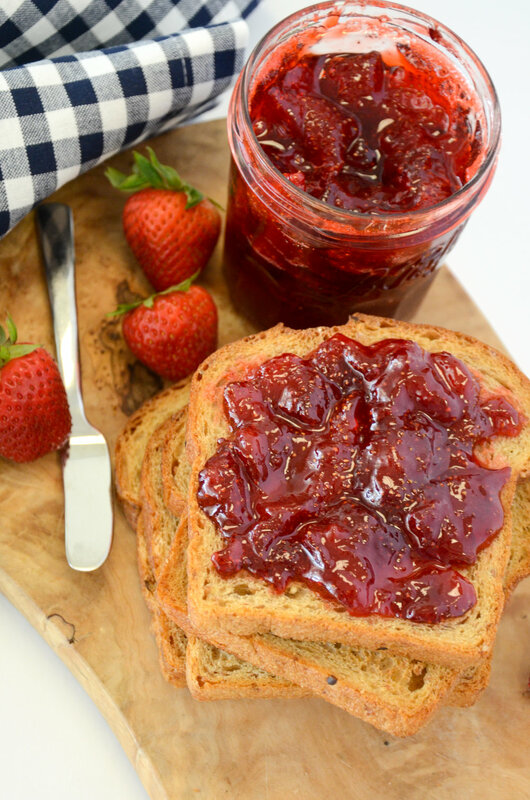 in thirty minutes, and you will have homemade jam to show for it! Could there be a better way to spend thirty minutes? Not in my book. Before we get started, here are a few housekeeping things you need to know. For safety. You must store this jam in the fridge. We are not canning or preserving, which means this is not shelf-stable. It requires refrigeration all the time. Also, and I feel ridiculous even saying this, but boiling jam is very, very hot. Think, molten lava. If you touch it or taste it, it will seriously burn you (or your children), so please be careful. Botulism and burn warning are out of the way, so let's get started! For every one pound of fruit, you will need two cups of sugar and two tablespoons of lemon juice. Why lemon juice? Two reasons. The acidity balances the sweetness, and the pectin in lemon juice helps thicken the jam. One batch will yield about one cup of jam. There are two phases to this process, and I am going to explain them both to you because I want you to succeed! This process is not difficult, but knowledge is power, and so I'm going to break it down for you. Slice the fruit if needed, and place it in a skillet with the sugar and lemon juice, and turn the stove to medium. Cold pan. Cold fruit. Cold stove. This begins Phase One. Phase One is the time it takes to go from cold fruit to boiling fruit. The time it takes for you to complete Phase One is completely dependent on many different factors including the type of stove you have (gas or electric), the kind of pan you are using (thick or thin, cheap or expensive), and how long it takes your stove and pan to heat. No matter how long it takes, it will look a lot like these photos. In my example (electric range, expensive pan, slow-moving heating element) it took almost ten minutes for my fruit mixture to begin to boil. Once it begins to boil, we have ended Phase One and begun Phase Two. 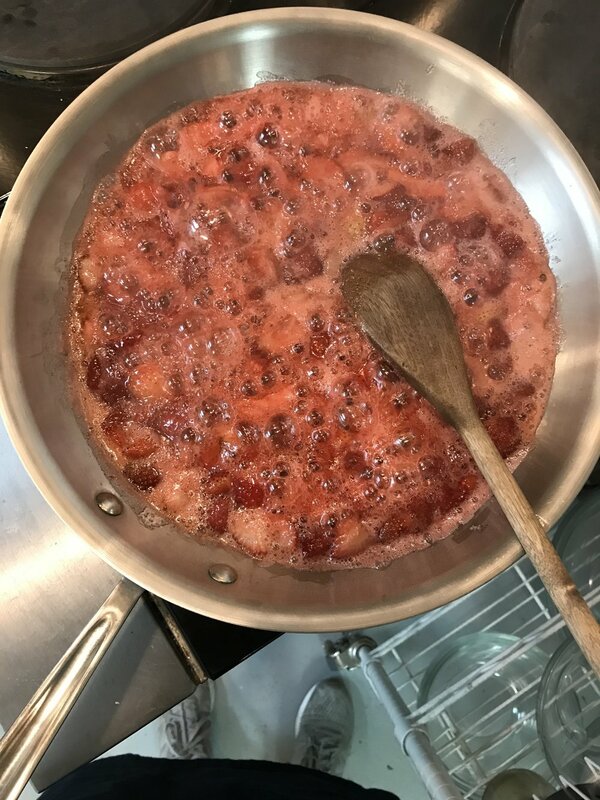 Phase Two is the amount of time it takes for the jam to thicken once it is boiling. This time will vary depending on the type of fruit you are using. Strawberries thicken fairly quickly. Cherries take forever (because they have a lot of water). Blackberries are somewhere in the middle. The jam is done when the foaming has subsided, and the boiling takes on a syrupy look. In my example with the strawberries, it boiled for ten minutes. Once the jam is finished, take it off of the heat and let it cool a bit. (Please see burn warning above.) You can in theory use it immediately, or you can put it in a cute little jar and save it. As it cools it is going to really thicken up, so know that what you see in the hot pan does not equal what you will have once it cools in a jar. Here's the deal. You can't really mess this up, so don't let the ambiguity of the timing prevent you from giving this a go. What's the worst that can happen? If you don't boil it long enough, your jam will be a little loose. But that's okay. If you boil it too long, your jam will be thick. But that's okay. It's all going to be okay because you are making homemade jam, and you are amazing! Grab some fruit. Grab a skillet. And go! 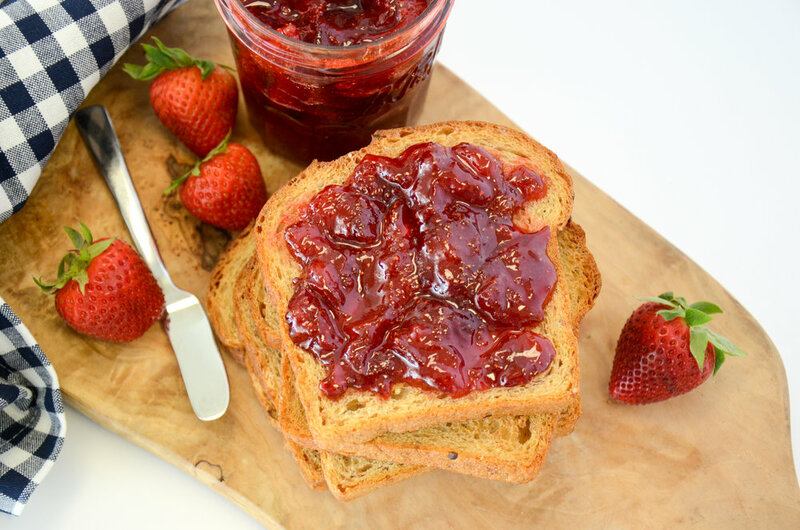 Your toast has never had it so good.